Energy absorption/dissipation – This rating, given in joules, tells you how much energy the surge protector can absorb before it fails. A higher number indicates greater protection. Look for a protector that is at least rated at 200joules. For better protection, look for a rating of 600 joules or more. Response time – Surge protectors don’t kick in immediately; there is a very slight delay as they respond to the power surge. A longer response time tells you that your computer (or other equipment) will be exposed to the surge for a greater amount of time. Look for a surge protector that responds in less than 20 nanoseconds. Importantly: Make sure you’re informed before you buy, and read the back of the box or the product details before you buy anything. You don’t want to invest in a surge protector only to find out that it’s far too weak to protect your devices, or it’s a surge protector in name only. Remember, the most expensive is not always the best. The best thing to do is figure out what you need to protect and buy accordingly. Fixed RCD testing… Why is it important? At every workplace there is at least one Electrical switch board that is built to divide the power and lighting into manageable circuits feeding, lights, equipment and power points for us to use. Though we may not have an understanding electricity, it is important that you know about the little understood device called the RCD (residual current Device) or sometimes referred to as the Safety Switch that will find amongst the breakers and or fuses in this panel. An RCD is an electromechanical device,that detects any shunting of electrical power to earth thereby shutting the circuit down in mere milli-seconds, in doing so avoiding electrocution to personnel and possible fire hazards. But this is a bit like push button testing a battery smoke alarm it only test the resultant action it doesn’t test the actual detection part of the device. Tested & True ~ test & tag Lonsdale We know how to test all types of test sensitive electrical equipment like that of a RCDs and Surge Protected devices…We specifically use the STC ProLogger 2 it can perform RCD testing, Earth Leakage Detection and Run Testing all in one neat piece of equipment. On top this all our Technicians are Trained to National Standard UEENEEP008 in test & tag operations by Intertag in Sydney NSW, all our Equipment is in good repair and up to date. Most of all we pride ourselves on our Knowledge of OH&S legislation and the current Australian Standards ensuring that you get Quality Service at a competitive price. How do surge protected power boards work ? At first glance a surge protected power board operates like any other Power Board. It shows its ability at that moment when too much voltage gets passed along the transmission line , the surge protected board lets only a ‘safe’ amount through to the connected equipment. The rest it channels into the electrical outlet’s ‘earth’ and safely dissipated into the ground. When a surge occurs at a certain level above normal voltage, a component built into the surge protected power board becomes conductive and starts to carry the excess electric current back down through the ground wire, so the damaging high voltage doesn’t reach connected equipment. Once the surge ends, that protective component resumes its ‘dormant’ stage of being non-conductive. It’s a bit like an electrical version of a pressure valve. Australian domestic wiring is designed for a standard voltage of 230–240 volts. If the voltage goes too far above that, it can damage electronic equipment, which usually has many sensitive components. 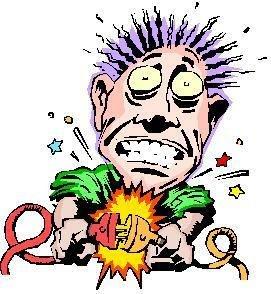 If excess voltage lasts for a very brief time (1–2 nanoseconds) it’s called a spike. If it lasts longer it’s called a surge. Even though a spike or surge can be so brief their duration is measured in nanoseconds, they can still cause damage to sensitive components. It is vitally important to protect sensitive business equipment, Computers, printers, photocopiers etc these items of equipment are sensitive to Surges in voltage. So what sort of a Surge Protected Board should you Buy ? Here are the specifications you should consider…Energy absorption/dissipation – This rating, given in joules, tells you how much energy the surge protector can absorb before it fails. A higher number indicates greater protection. Look for a protector that is at least rated at 200 to 400 joules. For better protection, look for a rating of 600 joules or more. Response time – Surge protectors don’t kick in immediately; there is a very slight delay as they respond to the power surge. A longer response time tells you that your computer (or other equipment) will be exposed to the surge for a greater amount of time. Look for a surge protector that responds in less than 15 nanoseconds. It is best to look for a Surge protected board with an indicator light that tells you if the protection components are functioning. Eventually the protection component will burn out after continual power surges, but the board will still function as a power connection. Without an indicator light, you have no way of knowing if your protector is still functioning properly. Other important features may include ? Building wiring status indicator: Detects potentially dangerous wiring problems in the wall outlet. Circuit breaker: Protects the surge board from overload by connected devices drawing too much current. EMI noise filtration: This reduces or eliminates line noise (electrical interference). Other connections: Surge protected sockets for coaxial cable, modem or Ethernet network, all of which can also conduct high voltage that can damage connected devices. 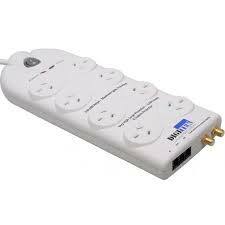 Outlet spacing: Allows more room for one or more devices that use a transformer block. Sockets: Check the number of mains power sockets available, usually from four to eight.